SHOT Show 2017 – Tom takes aim at the gun safe industry exposing it for what it really is. 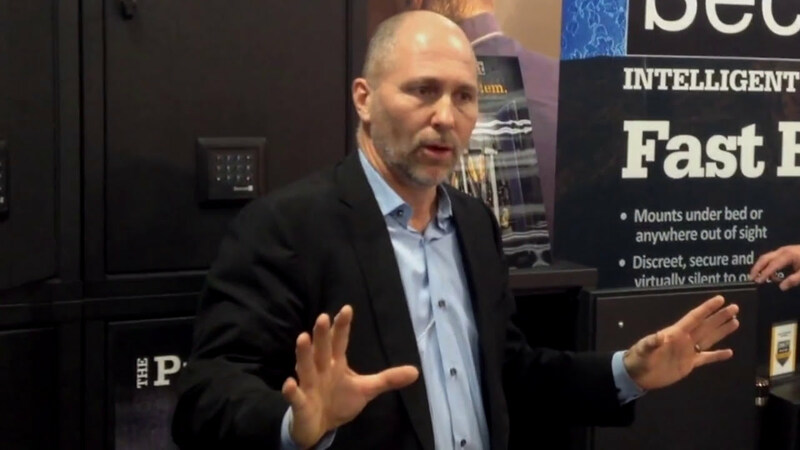 In this presentation from the SHOT show, Tom goes through all the ways the gun safe industry manipulates the facts and distorts the truth about safes and gun storage. When you understand the truth about this industry you will be in a position to make much better decisions. Ricky, thank you for taking the time to comment. SecureIt Agile gun storage cabinets do not have a fire rating. We are up front about this. The point of this presentation at SHOT Show is that we feel the gun safe industry is misleading and in some cases deceptive in the representation of their products and security claims. The basic gun safe sold in America may have a sticker on the door that says “fire rated” but what does that really mean? In many cases it’s simply a sticker and the gun safe has not been tested in any way. If you want a real fire rated safe you need to look at UL Class “TL” safes. However, most gun safes are built to Underwriters Laboratories (UL) “Class RSC” standards. This is a very low security rating and technically according to UL, not real safes. Class RSC stands for “Residential Security Containers”. UL would not allow the use of the word “safe” in the class discription. My background is in military weapon storage and armory design, where we must adhere to absolute standards. We look in the consumer market and simply feel that the gun safe industry now produces products that fall well short of claims. As stated in the presentation, data supports that whether your guns survive a fire or not has more to do with the nuances of how the fire burns than the type of container in which they are stored. With that data in mind, we feel UL class RSC gun safes sold in sporting goods stores across the country do not offer any better fire protection then a basic steel cabinet. You still have not said anything about your fire ratings??? Thanks for the comment. Our products do not carry a fire rating. As mentioned in the video and in another blog post, neither are most gun safes. There is a lot of misinformation in the gun safe industry, and fire safety rating is no exception. In fact, most gun safes are not fire rated since the 1970’s. The “fire rated” sticker on the door of most safes is misleading and, in many cases, a false statement. So all the YouTube videos Liberty Safes have posted are all BS? Are Liberty video’s BS? Yes and no. Liberty is not blatantly trying to deceive anyone. They are however trying to sell you a safe, or more correctly a Residential Security Container (UL-RSC). However, the videos do not tell the complete story and are misleading. First, in the Science channel video they reference “plate steel”. That is BS. They are using coiled steel (12ga – 14ga) not plate. This is misleading as there are plate steel safes made in America that are much much stronger than Liberty. Secondly, they say “Outer shell is a sandwich of ultra tough steel and slabs of ground up rock” Is this BS? That’s an opinion. Their “ultra tough steel” is simple cold rolled 12 and 14 gauge steel. As far as tough, this is basic soft steel. “Slabs of ground up rock” that sounds strong and powerful, much better than drywall, sheetrock or gypsum board. It’s basically drywall. Lastly, the term sandwich may lead many to think the construction is steel – drywall – steel. It is not. It is steel, drywall then carpet. Liberty safes have a single layer of thin steel. Their fire ratings are subjective and self-created. They do not have a UL fire rating. They have several pry test videos that are accurate for a pry threat. However, they do not address a simple grinder with a cut off wheel. I can open a Liberty safe in a few minutes with an $11 grinder from Harbor Freight. While some of their claims are valid, they do take a lot of “creative license” and use fancy words that sound really good to describe basic parts. Liberty spends more money on advertising and marketing then any other gun cabinet manufacturer in the world. Is their product better(than other US made safes)? No it is not. Ft Knox and AMSEC offer far superior cabinets in terms of security and fire protection but they do cost more. In my opinion, An $800 – $1800 gun safe is not worth the money, buy a steel gun cabinet. If you are concerned about security and fire you need to look at double walled steel safes with fire board sandwiched between the steel layers. This is NOT what Liberty is making. Ft Knox and AMSEC offer safes like this. They start around 6-7 thousand dollars. You do get what you pay for. Cheap safes are bad, not secure and offer little in the way of fire protection. The Videos on their channel are designed to sell their product, not to educate people about security threats, proper gun storage and home defense. Is it a gun safe? Or is it an RSC? I live in California, if I purchase one of these will I be in compliance with California state law for firearm storage? Sorry for the delay. I wanted to respond to your comment myself. I have been traveling. Yes I do hit Liberty and all gun safe manufactures pretty hard. My frustration with them boils down to honesty and integrity. I met with the president of Liberty and his senior staff a few years ago to talk about working together. After the meeting we decided not to pursue the relationship. When I brought up capacity and gun safes, their head of sales said this is our industries little white lie. They are OK with this. I am not and you should not be either. They are not being honest. Please note, these are good people and a well run company however this entire industry has been drinking their own cool-aid for too long. They do not see the dishonesty in how they represent their products. California DOJ. you ask: Will you be compliant? I don’t know. In an effort to make gun ownership as difficult as possible in CA, the state legislature has changed the rules on this serval times. We have not submitted the current model 52 to DOJ compliance testing at this time. Would we pass? yes. Do we care? that’s the question. We are very frustrated with the ambiguity of the legislation and the whole process. If we jump through their silly hoops we get “DOJ Certified”. Will it increase sales? I do not think so. Currently we ship more Model 52s and Fast boxes to California then any other state. I really don’t see the DOJ thing as being very relevant. We will be releasing an updated Model 52 in August 2017. We have made some changes to the locking system and redesigned the keypad for a better look. We will most likely certify this model. Hello Tom, I just finished watching your video presentation from the 2017 ShotShow, and I was very enlightened. You shared several key facts that are direct flaws in the current gun “safe” products available to the consumer, as well as, you pointed out several aspects of gun safety, security, care and easy access that every gun owner should be aware of. It’s a shame that many companies design their marketing programs with “little white lies” to lure in a consumer to buy their product with false hope and controlled product testing that produces skewed results. Owning a firearm, of any kind, it is the owners responsibility to properly secure them to ensure they do not bring tragic harm to anyone else, and they did not end up in a criminals hands. My dissatisfaction with the “safe” products available on the market led me to build a gun room in the basement of my home to properly secure my firearms. I wish I would have had your product available to me because I could have accomplished my goal for a lot less money. Thank you for this informational video and for holding the safe industry accountable. I have always had questions about corrosion and fire protection claims that I felt were never fully answered by the “other guys.” Corrosion is especially important to me since I collect antique coins. You provided a comprehensive explanation of the major issues and exposed some of the “white lies” from the industry. Furthermore, your cabinets are simple, smart, and perform as advertised. Again, I appreciate your fervor for integrity and high-quality products. Keep it up! Glad to see you directly taking on, and eloquently and effectively rebutting the keyboard cowboys. I second what Greg said. I think your responses to some off these obvious attempts to bait or troll proves what many have already found to be true about the integrity of you and your company. Just got my agile 52 today. Super excited to be part of the family. Thank you for your video and for building a solid cabinet. I appreciate that you take care of the military and LEOs with a discount, too. I placed my order for the Agile 52 and bin kit earlier today. I look forward to receiving it. Nicely presented and excellent product. I have owned several traditional gun safes, and I can attest to all of the facts about the gun safe industry you are presenting. It has always struck me that it could be done better, and you guys have done it, nice job. i ordered my first Agile 52 for the house, put it together today, and I couldn’t be happier. I originally decided to use this product because I have some very high end firearms, including double rifles and 5-10K custom rifles. I felt they would be better served being stored in your product, and after putting it together and using the product, I am sure of it. I currently have a “30 Gun” traditional gun safe, which I will surely be replacing over time, as I acquire additional SecureIt products. I truly believe in your strategy here, so keep it up.